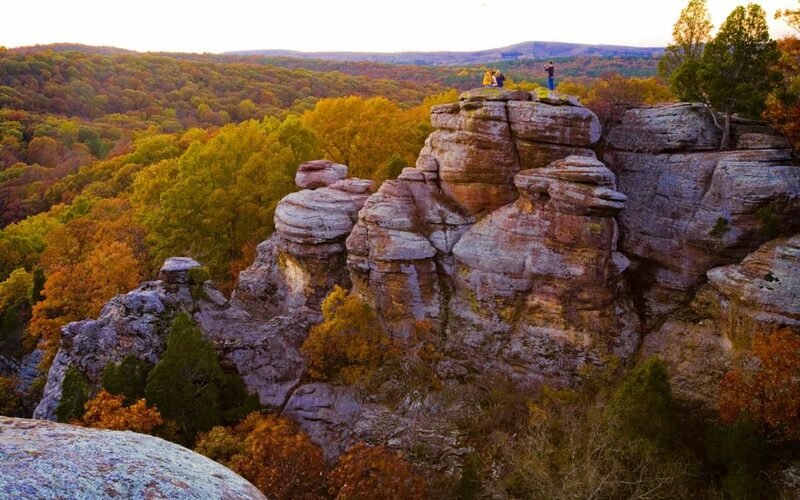 If ever there was a place to indulge in the marvels of architectural design, Illinois is it. Downtown Chicago is world-renowned for its skyscrapers, while suburban Oak Park boasts the largest concentration of structures designed by Frank Lloyd Wright, one of America’s most famous architects. 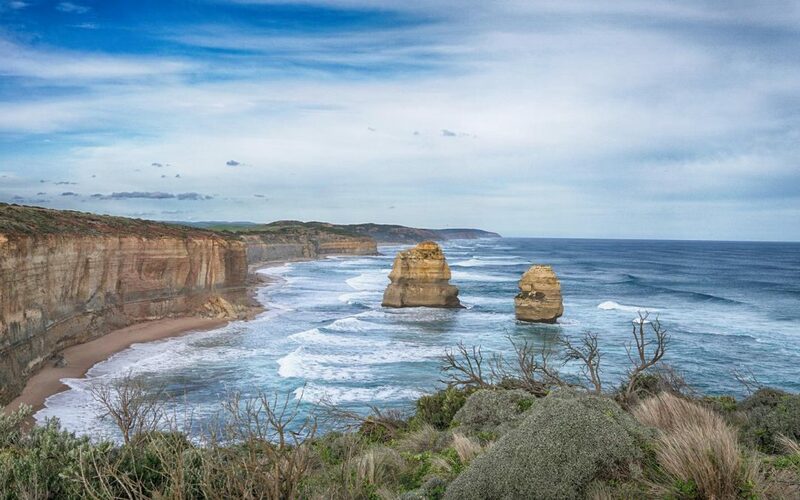 But wherever groups travel throughout the state, exquisite examples of architectural splendor—from private residences to houses of worship—can make impressive additions to any itinerary. 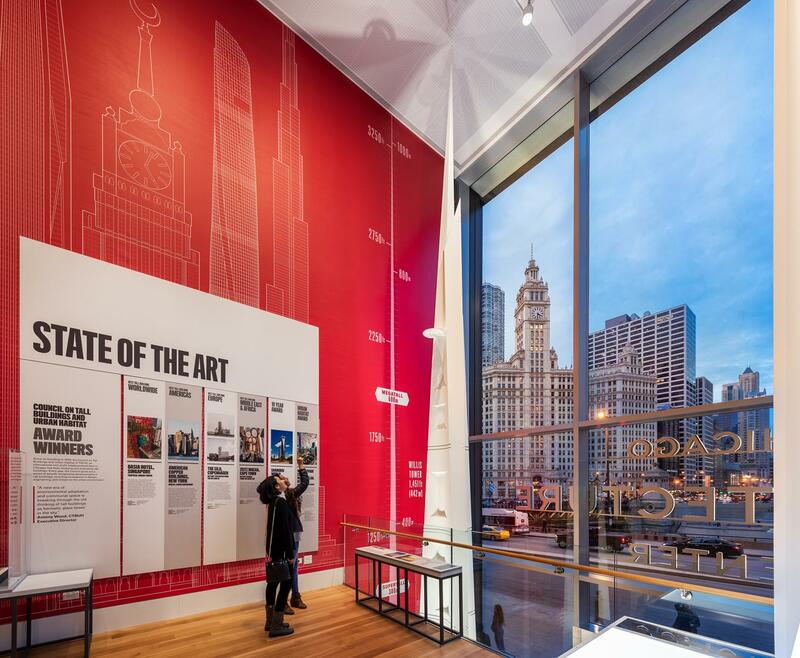 Chicago’s newest must-see cultural attraction is the Chicago Architecture Center (CAC), which in 2018 relocated to dazzling quarters with a 40-foot-tall window overlooking the Chicago River, Michigan Avenue Bridge and white terra cotta Wrigley Building. Conveniently, the dock for the popular Chicago Architecture Foundation (CAF) river cruise lies just below. 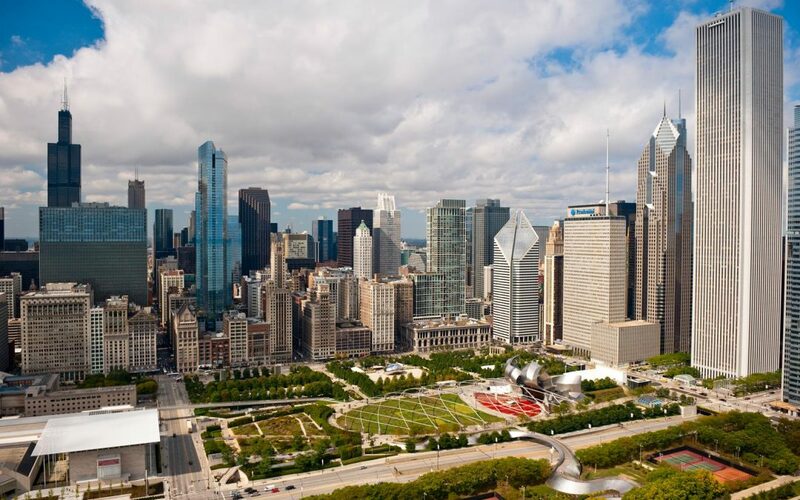 Permanent exhibits, including a gallery filled with supersized scale models of famous skyscrapers in Chicago and around the world, occupy two levels of a steel-and-glass tower designed by the studio of Ludwig Mies van der Rohe, the master of mid-century modernism. The first-floor Chicago Gallery tells how the city became the epicenter of modern architecture; its 4,000-building Chicago Model Gallery has a film and light show depicting the city’s early growth and rebirth after the Great Chicago Fire. 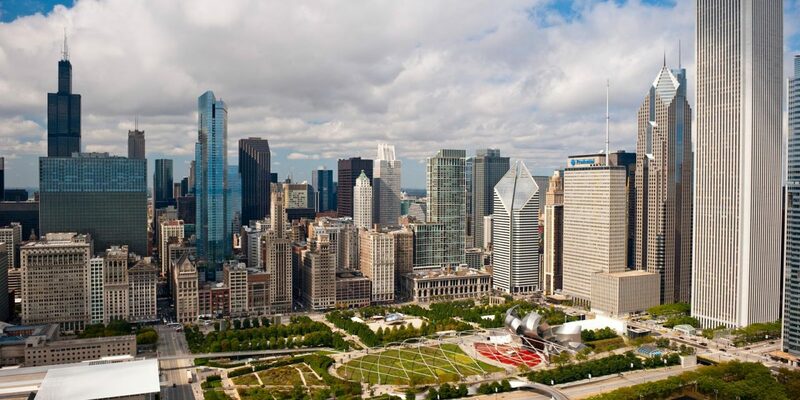 Using interactive touch screens, visitors can orient themselves to Chicago and search buildings by architect or style. 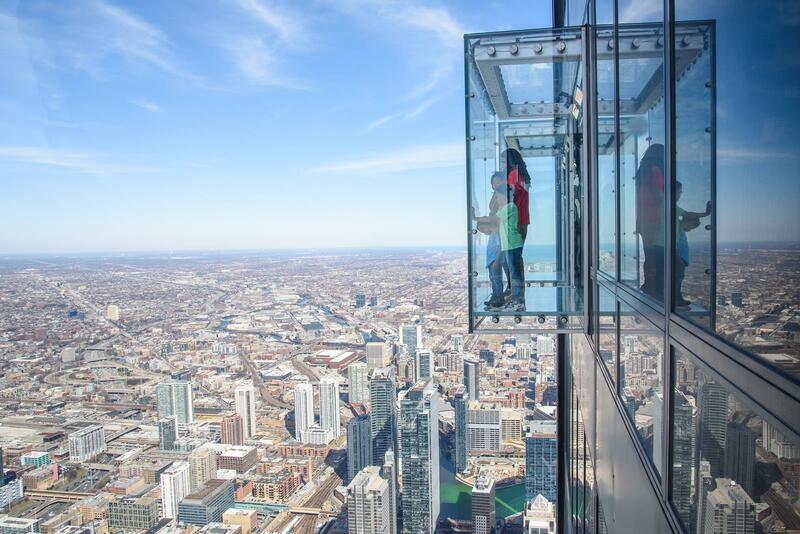 The CAC, with one of the best gift shops for Chicago books and souvenirs, is the starting point for a variety of downtown walking tours that spotlight both historic and modern structures. 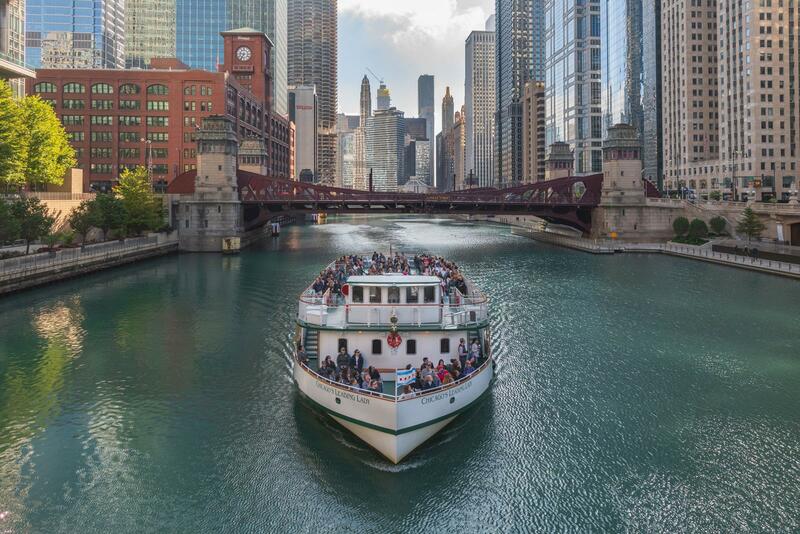 On 90-minute CAF whirls aboard Chicago’s First Lady Cruises, which operates from late March to late November, docents interpret more than 50 buildings along the river as you lift your eyes skyward. In Hollywood’s heyday during the 1920s and ’30s, theater architects reveled in the artistic freedom they were allowed in designing movie palaces, adorning them with opulent chandeliers, majestic staircases, murals, statuary and acres of gold-leafed plasterwork. Several such theaters in Chicago’s Loop have been restored to their former glory and function as performing arts centers. 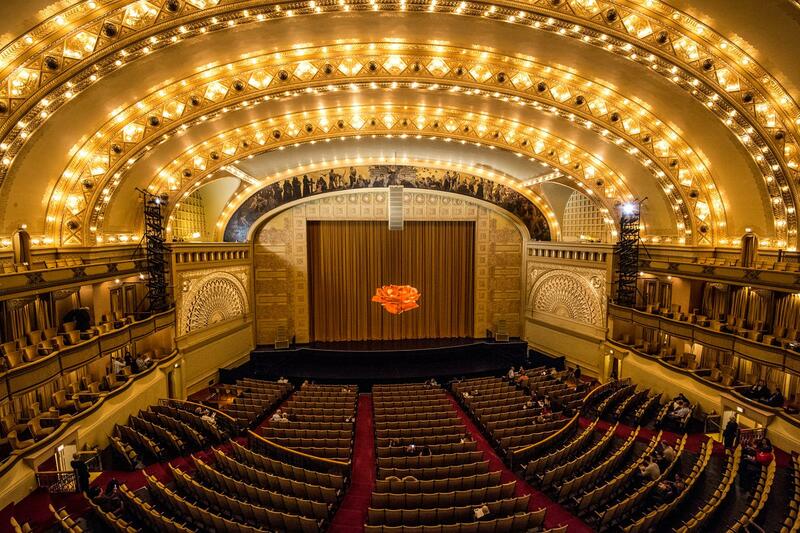 The “Historic Theatre Tour” offered by Broadway in Chicago showcases the splendor of yesteryear in the Cadillac Palace Theatre and newly renamed James M. Nederlander Theatre (formerly known as the Oriental), both built in 1926 on West Randolph Street; sometimes the 1906 CIBC Theatre, once a vaudeville venue and currently host of the blockbuster musical Hamilton, is paired with one of them. Travelers from across the globe flock to Oak Park, Chicago’s neighbor to the west, to visit the Frank Lloyd Wright Home and Studio, where, from 1889 to 1909, Wright developed a new American architecture—the Prairie style, with its horizontal lines, lowpitched roofs and use of natural materials like brick and wood. The Frank Lloyd Wright Trust conducts tours of the home and surrounding neighborhood, which boasts 25 Wrightdesigned buildings within walking distance. Also included on Oak Park tours is Wright’s 1905 Unity Temple. Built of exposed concrete for a Unitaian congregation after its church had burned to the ground, the cubist masterpiece, now a National Historic Landmark, defied almost every convention of religious architecture. The only surviving public structure from Wright’s Prairie period, recently restored Unity Temple has two skylighted spaces—one for worship and one for the congregation’s social gatherings—connected by a central entry foyer. The harmony of architectural and decorative elements exemplifies his philosophy of organic design. As a lifelong member of the church, it was deeply personal project for Wright. Late in his career, he said of Unity Temple: “That is my contribution to modern architecture. 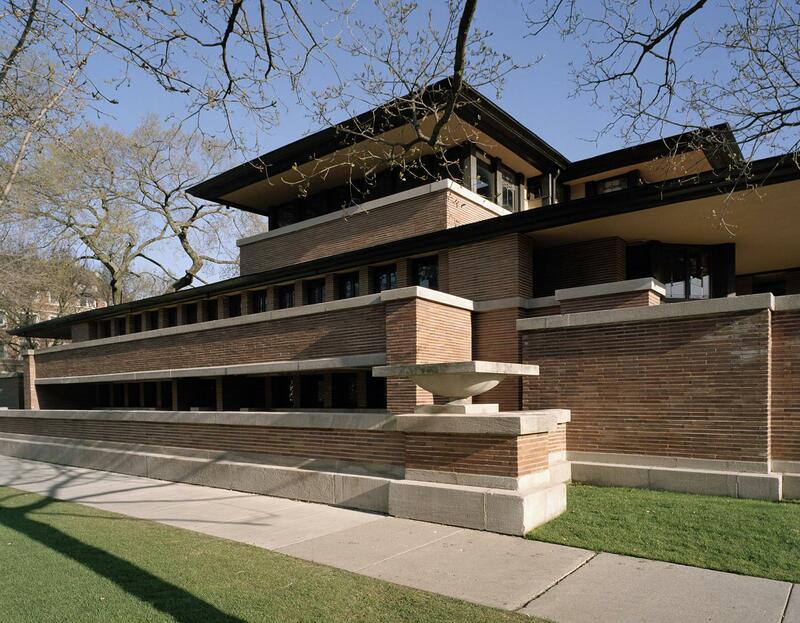 These Oak Park gems and other examples of the genius’s work make up the Illinois Frank Lloyd Wright Trail, an ambitious project unveiled in 2018 by the Illinois Office of Tourism. The sign-posted architectural trail features 13 Wright-designed buildings open to the public in nine cities. On the South Side of Chicago, the Frederick C. Robie House reemerges this year after a $3 million restoration that reveals Wright’s original 1910 vision of a dwelling place as a work of art, where exterior and interior, furniture and ornament, come together to form an integral whole. 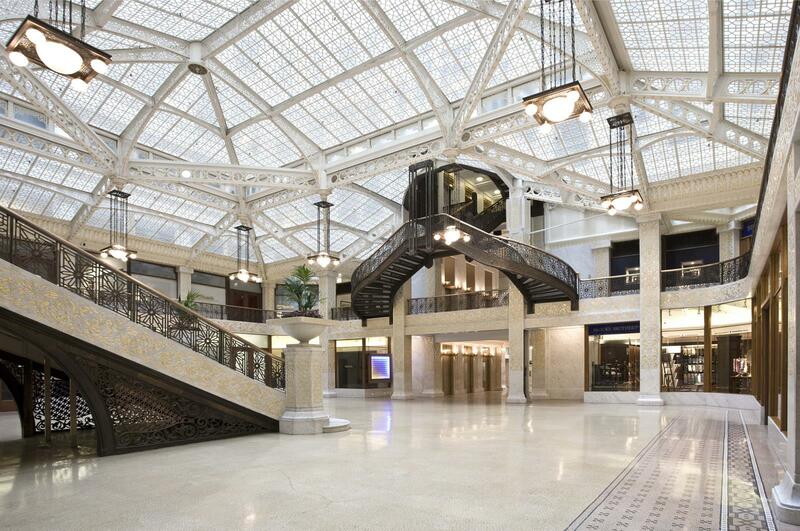 It is the consummate expression of Wright’s Prairie style A showcase of Wright’s work in downtown Chicago is his 1905-1907 remodeling of the light-filled lobbies and central court of the 11- story Rookery Building, the tallest building in the world at the time it was completed in 1888. On the Wright Trail in west suburban Geneva, a town nestled in the Fox River Valley, the Colonel George Fabyan Villa is a Prairiestyle residence with a Japanese garden and Dutch windmill. On the banks of the Fox in Plano stands another country retreat, Mies van der Rohe’s 1951 Farnsworth House. Owned and managed by the National Trust for Historic Preservation, this glass-box residence, with its uninterrupted views of the landscape, ranks as one of the world’s most significant examples of modernist domestic architecture. Fronting the Kankakee River in Kankakee, the B. Harley Bradley House (1900-1901) was likely the first home Wright designed in the Prairie style. 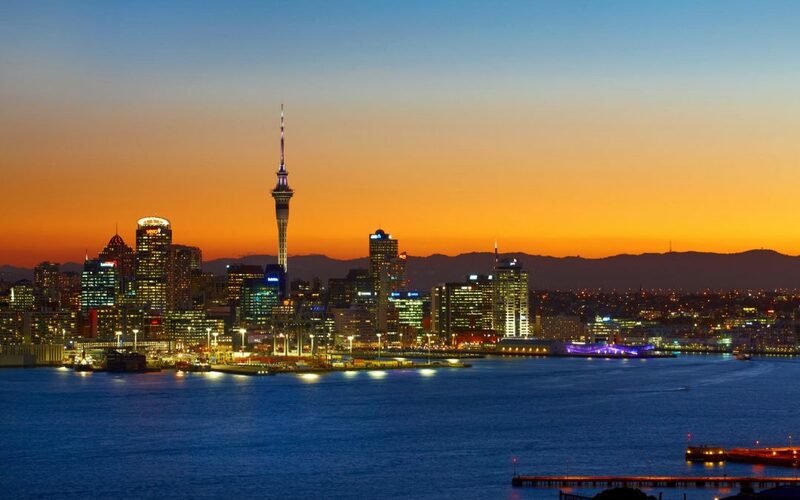 From this location you can embark on a half-hour boat cruise to see other homes along the shore. Muirhead Farmhouse in Hampshire and Laurent House in Rockford represent Wright’s Usonian style, a term he coined to describe his pastoral vision of a more modest approach to architecture adopted toward the end of his career. The functional, single-story Laurent House (1949) was custom-designed for a paraplegic U.S Navy veteran confined to a wheelchair, decades ahe ahead of ADA accessibility requirements. At the southern end of the Wright Trail, Springfield’s lavish 1904 Dana-Thomas House was commissioned by a wealthy socialite for whom money was no object. The Illinois State Historic Site has 35 rooms spanning 16 varying levels and encompassing 12,000 square feet of living space. Never significantly altered, the maze-like home contains the largest collection of site-specific art and oak furniture designed by Wright himself, including art-glass windows, doors and light fixtures. The barrel-vaulted dining room and gallery/ballroom have musician balconies where string quartets would entertain guests. Connecting the main living quarters to the gallery and library is a 60-footlong pergola hallway beneath which are a bowling lane, billiard room and walk-in vault. Another fine Springfield home open for tours, the red-brick Illinois Governor’s Mansion, sparkles after a privately funded, recently completed three-year restoration that included redecorating the interior with antique period pieces and an orientation room with exhibits and a short video. As the nation’s third oldest continuously occupied governor’s mansion, it has been home to Illinois chief executives since 1856. Also worth a look is Edwards Place, the oldest house in Springfield on its original foundation. Interpreted to 1857, when it was remodeled in the Italianate style, the recently restored house reflects the comforts enjoyed by well-to-do lawyer Benjamin Edwards, who entertained guests such as Abraham Lincoln, a relative through marriage. Edwards Place shares the site with the Springfield Art Association, which can cater meals or arrange art projects for groups. A Springfield visit is not complete without a tour of the massive Illinois State Capitol, which extends three blocks along Second Street. Built from 1868-1888 and magnificently restored several years ago, the limestone showplace, a combination of Renaissance Revival and Second Empire styles, sports a zinc-coated copper dome and stands 74 feet taller than the U.S. Capitol. Visitors marvel at the grand staircase, elaborate painting depicting chapters in Illinois history and statues of prominent legislators, including Lincoln and Stephen Douglas. The imposing edifice is a symphony of stained glass and gold leaf, crystal chandeliers and ornamental plasterwork. It’s possible to catch a legislative session from the balcony-level seating area. From the Senate gallery, tour guides will point out the desk of Barack Obama when he was a state senator (1997-2004). A more delicate-looking dome, one with white, lace-like ornamentation graces the Baha’i House of Worship, better known as the Baha’i Temple, a landmark in Wilmette, north of Chicago. Built along the Lake Michigan shoreline in 1953 as the first Baha’i place of worship in the Western Hemisphere, it is one of only seven in the world. Surrounded by fountains and gardens, the nine-sided building is a blend of Eastern and Western influences. A movie in the temple’s welcome center tells its history. West suburban Bartlett claims a stunning temple of its own, though it’s not as well-known as the Baha’i shrine. BAPS Shri Swaminarayan Mandir, the largest Hindu temple in North America, awes visitors with its pinnacles, domes, fountains, gorgeous gardens and teak interiors. Made of hand-carved Turkish limestone and Italian Carrara marble, the $30 million beauty was shipped piece by piece from India and assembled in 2003/2004—without steel or iron. Illinois’ historic home attractions, scattered throughout the state and each with a style of its own, not only intrigue history buffs but architecture fans as well. Villa Kathrine in Quincy, for example, would look at home in Morocco or Tunisia. Built in 1900 for the wealthy, eccentric George Metz in 1900 and named after his mother, it is based on his sketches of villas in North Africa. Features include a replica of a mosque minaret and courtyard with a marble mosaic reflecting pool. Set on a bluff above the Mississippi River, Villa Kathrine serves as Quincy’s visitor information center and offers guided tours. Along Lake Michigan in Evanston, just north of Chicago, the 1894 Dawes House was the French chateau-style mansion of lawyer/financier Charles Gates Dawes, who served as U.S. vice president under Calvin Coolidge. Round, two-story towers form the front corners of the 25-room, tan-brick house, which now is home to the Evanston History Center. Tours show off the oak-paneled walls, musicians’ gallery in the dining room and great hall’s baluster oak stairway. 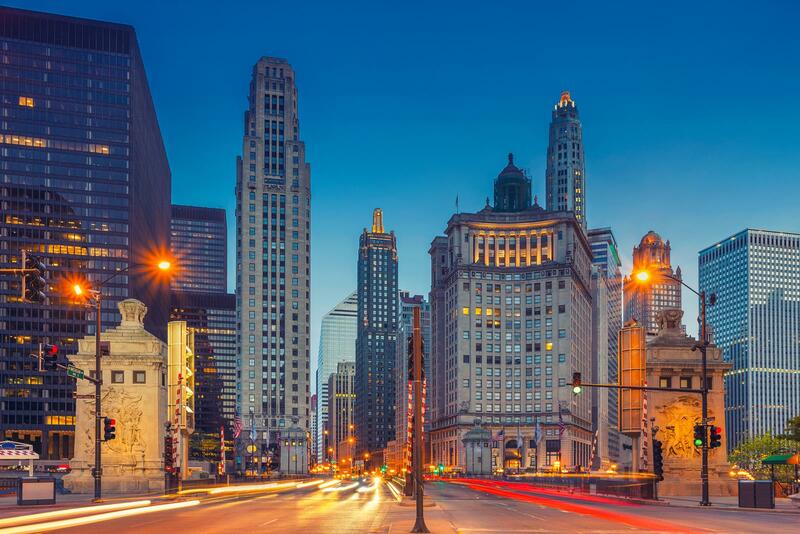 From commercial towers and palatial theaters to houses of worship and remarkable private homes, Illinois, with its rich architectural heritage, has a building or three that will make your group itinerary rise above the rest.